A high quality all metal body tool with absolutely no plastic fittings. 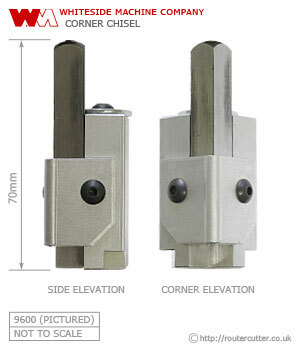 This corner chisel features a sharp 9.53mm × 9.53mm (3/8” × 3/8”) L-shaped cutting blade made of hardened steel. A very useful tool for squaring ‘round corners’ that remain after routing a shallow mortise, for example a hinge mortise. The chisel is spring-loaded and requires a light blow/strike from a hammer. The cutting edges can be re-sharpened. Made in the USA by Whiteside Machine Company.